Beaches in Vietnam have long been one of the best-kept secrets of Southeast Asia, but since then the countries coastal areas are now becoming more well known! With over 3000 km of stunning coastline, Vietnam is full of infinite stretches of powdery sand, tropical islands and countless coves and lagoons just waiting to be discovered. An ideal destination for a beachgoer, the long coastline is in the tropical zone which makes for clear water, white sand and the perfect places for water sports and watching the breathtaking sunsets. With so many beaches to see and so little time, we’ve made a list of the best Vietnam beaches that can’t be missed! 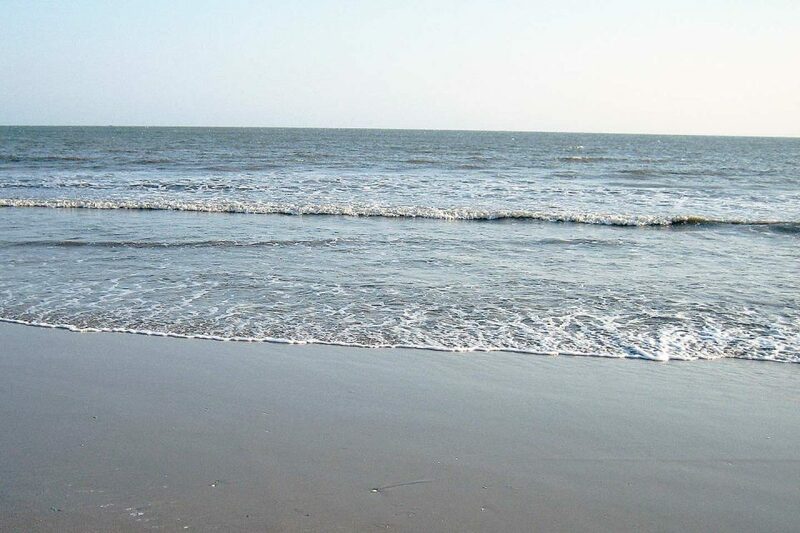 What we love: As this beach is a big tourist destination, it is well kept and boasts a high number of water sports! 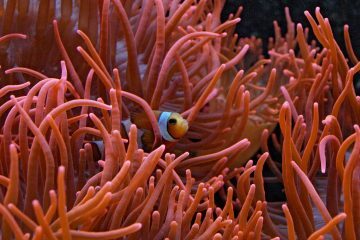 The beach is home to Rainbow Divers, Vietnam’s first PADI-certified dive center, so some of the best diving in the South China Sea is guaranteed here. Other adventures include snorkeling, wakeboarding, kite surfing, and banana boat rides! If water sports aren’t your thing and you want to relax, there are spa resorts nearby including on one of the islands. How to get there: You can easily get to Nha Trang from Hanoi or Ho Chi Minh by flight, train, bus or motorbike. Check Bookaway or 12go to see transport schedules. As the heavyweight champion of Vietnam beaches, Nha Trang beach is the most famous due to its unique combination of city and natural beauty. The beach itself flaunts white powdery sand that curves around the ocean for miles and it is completely surrounded by creative sculpture gardens, pretty parks and neat rows of prune trees that are rarely found anywhere else. On one side, the beach is a gateway to the pristine islands that are spotted in the distance, while on the other, an energetic modern city surrounded by green mountains bustles on. 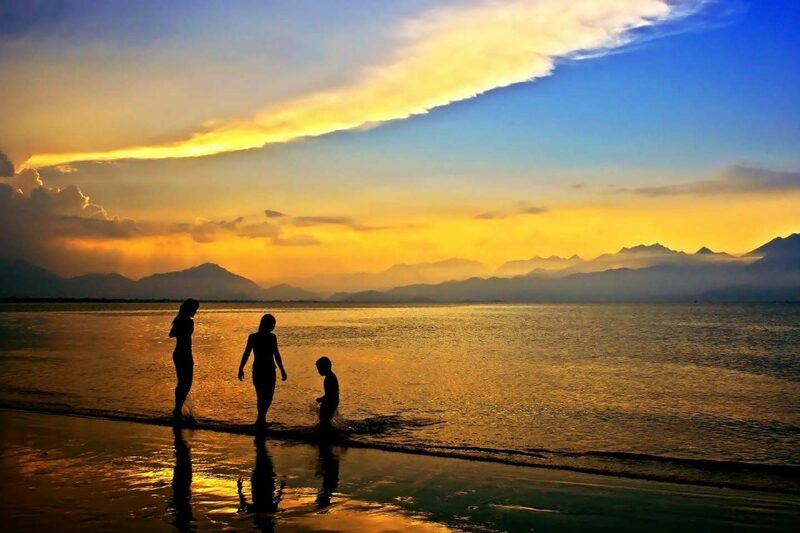 The perfect mix of city meets the sand, Nha Trang Beach can satisfy every type of traveler. As mentioned, there are tons of things to do in this area, especially if you love water sports. Click the button below to see our recommendations on tours and things to do in Nha Trang. What we love: Although we love beaches where we can kick back and chill, sometimes you want action and adventure. How to get there: The easiest way to get to Mui Ne is to fly into Nha Trang and take a bus or train to Mui Ne. 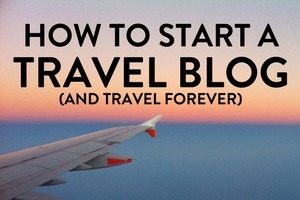 Alternatively, Ho Chi Minh is only 4 and a half hour bus ride away. Check Bookaway or 12go to see transport schedules. If you’re looking for sand dunes and kitesurfing, Mui Ne is the beach to head to in Vietnam. Back in the day, when Mui Ne was just a long stretch of sand, travelers camped on the beach with just the surroundings as entertainment. Nowadays, that stretch of sand has become a string of beach resorts to form a main coastal strip. 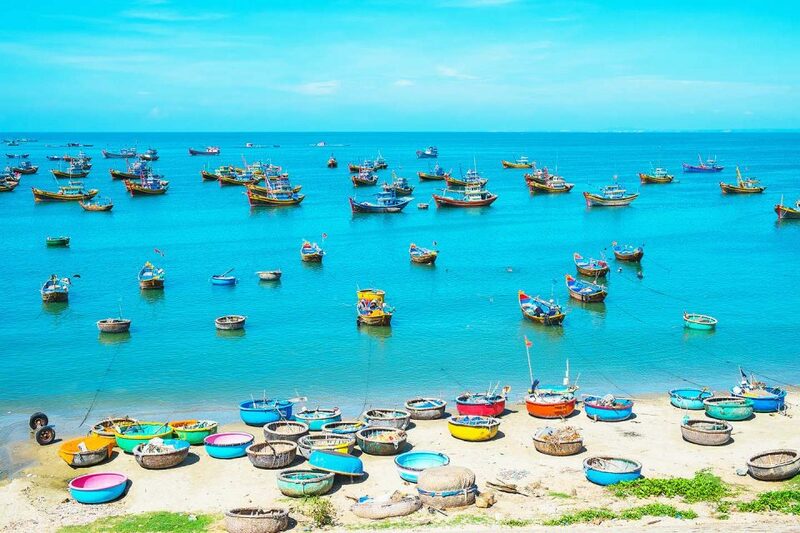 Despite the fact that Mui Ne may be moving upmarket, with its low-rise resorts amongst swaying palm trees and sand dunes, the original fishing village is still there, with giant round boats which the locals use to catch fish on a daily basis. Editor’s Note: Heading to Vietnam? Check out our What to Pack for Vietnam article and our full Vietnam Travel Tips post featuring the best things to do, where to stay, and what to eat. 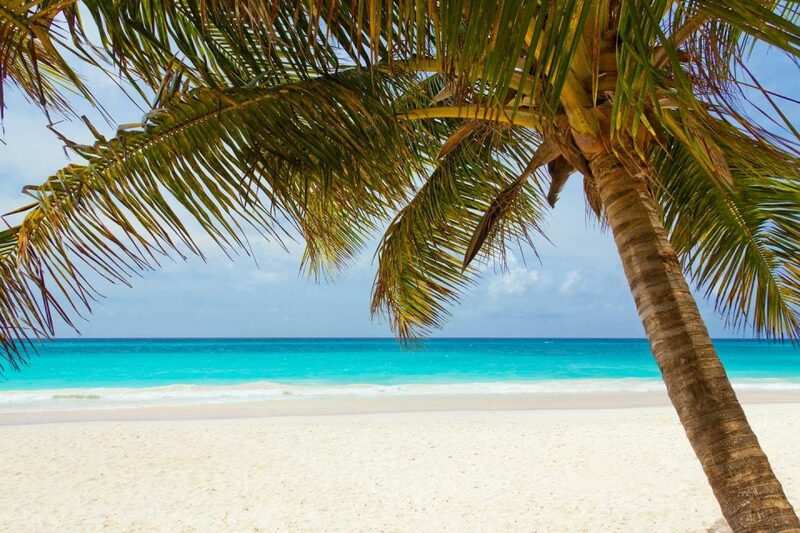 What we love: We prefer an uncrowded beach where we can get away from it all, so we would definitely opt for Doc Let Beach if we needed a break from the city! How to get there: Take the blue-white-yellow bus (#3) from Nguyen Thien Thuat Street in Nha Trang and get off at the last stop beside White Sand Doclet Resort & Spa. The ride takes about 1.5 hours and will cost approximately 24,000 VND per ride. The last bus back departs at 17:30 PM sharp. Check Bookaway or 12go to see transport schedules. 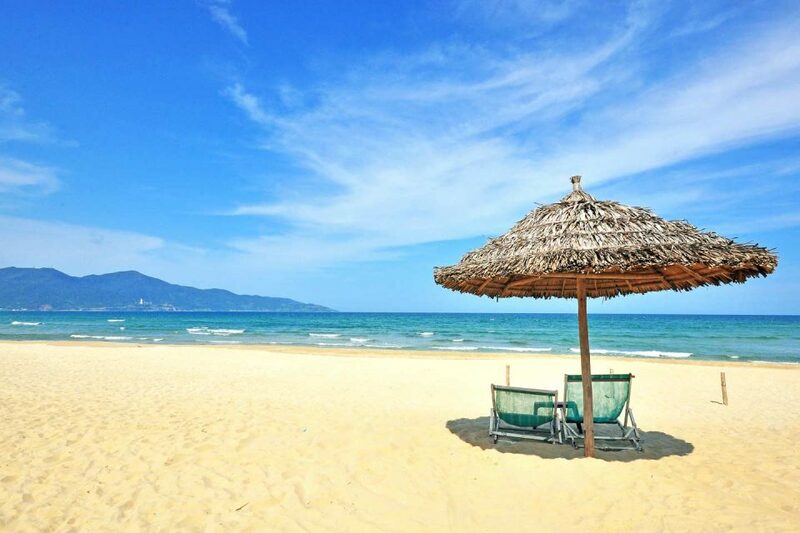 While the rest of the world are sunning themselves on City Beach in Nha Trang, why not slip up the coast 30 miles and have Doc Let Beach on the stunning Hon Khoi Peninsula for yourself? A prime location for a day’s beach-bumming, Doc Let Beach is postcard perfect with idyllic white sands surrounded by evergreen trees. With few tourist facilities, this beach is popular with renegade travelers who are looking for a secluded beach paradise. An uncrowded spot with true island vibes, the atmosphere of Doc Let is enough for you to travel there from afar. What we love: The whole setting of this area! Next to the beach is the Kinh River where crystal clear water flows into the sea. With the river, dense jungle and soft beach, it is just simply stunning being here. 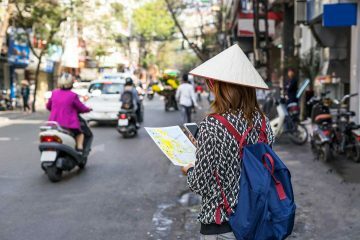 How to get there: You can easily get to Danang from Hanoi and Ho Chi Minh city via plane, train, bus or of course, by motorbike. Check Bookaway or 12go to see transport schedules. 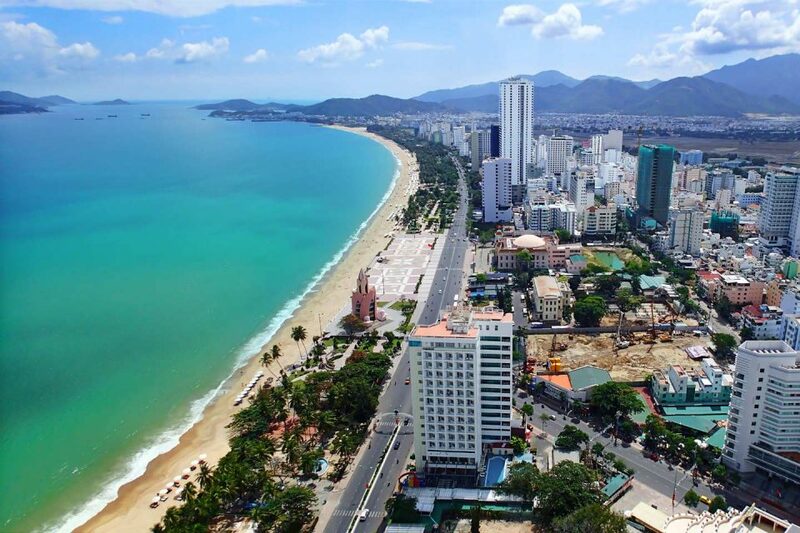 A place with history, Danang Beach was previously a central fighting area during the Vietnam war. However, since then, it has become increasingly recognized for its great beaches. 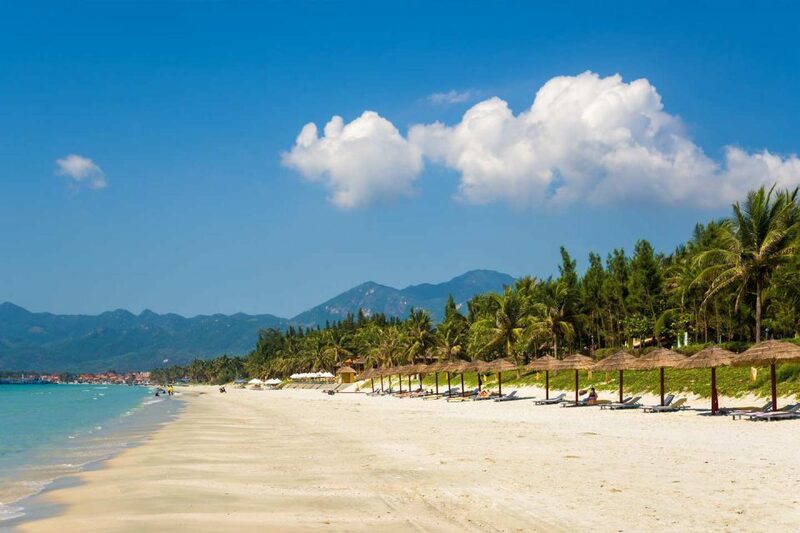 Danang Beach refers to a mammoth stretch of white sand and clear water, starting from Monkey Mountain to Hoi An with Marble Mountain sitting smack bang in the middle. With white soft sand, crisp sunshine, coconut palm trees and a pristine coral reef, Danang is one of the best Vietnam beaches for sunbathing, surfing and scuba diving. Don’t even get me started on the sunsets in this place- they are spectacular. Danang Beach is comprised of many ‘sections’ called My Khe, My An, Non Nuoc and Cua Dai. The first three are considered the ‘beaches of Danang,’ with My Khe being a busy expat area, Non Nuoc an unkempt village with an idyllic beach. What we love: There’s nothing we love more than spending the day soaking up the sun, right up until you watch the sunset in the evening. How to get there: Take a motorbike taxi from Hoi An city, it is only a 4km ride away. For yet another one of the best Vietnam beaches, why not head to An Bang Beach just north of its popular sister beach Cua Dai? Less tourist-focused than Cua Dai Beach, An Bang is usually the beach that is frequented by local expats in Hoi An. Dotted with beach bars and landscaped gardens, this beach is perfect for sunbathing and sipping cocktails with the occasional swim in the turquoise waters to cool off. Days will quickly fall into a pattern here, so if “eat, sleep, swim, repeat” sounds like your ideal getaway, An Bang Beach is for you. When you are tired of lazing around by the water, Hoi An is one of our favorite places to take a cooking class! The cooking classes here usually take you to the local markets before teaching you how to make local delicacies. 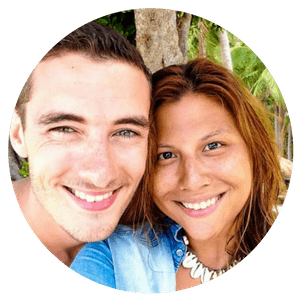 For cooking classes all over Asia, we recommend Cookly, a website you can use to book classes all over Vietnam. What we love: When we last went, we found the perfect local beachside bar and had the coldest beer imaginable while looking out at the turquoise blue waters…it was paradise. How to get there: The easiest way to travel here is by plane from Can Tho City, Ho Chi Minh City, Rach Gia and, less regularly, Hanoi. Other options include the high-speed train or ferry. Check Bookaway or 12go to see transport schedules. 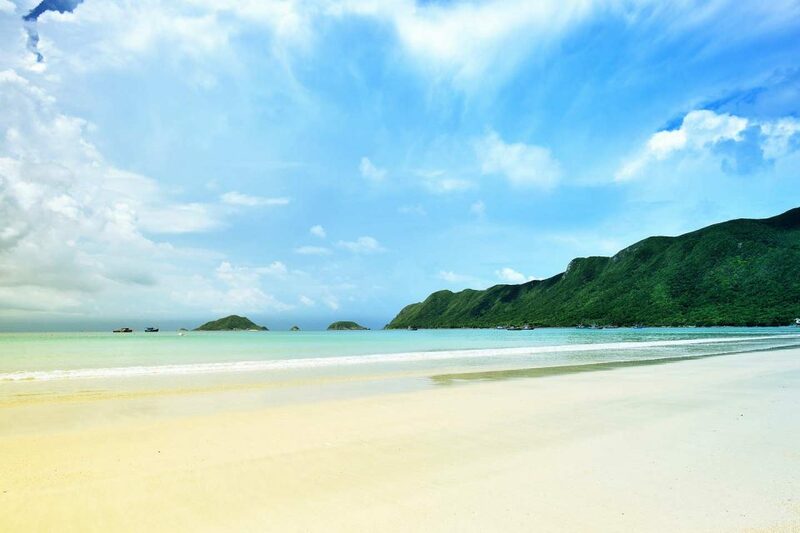 Although we are a bit hesitant to include this in our list due to recent pollution problems, Star Beach or Sao Beach is said to be one of the most beautiful beaches in Vietnam. 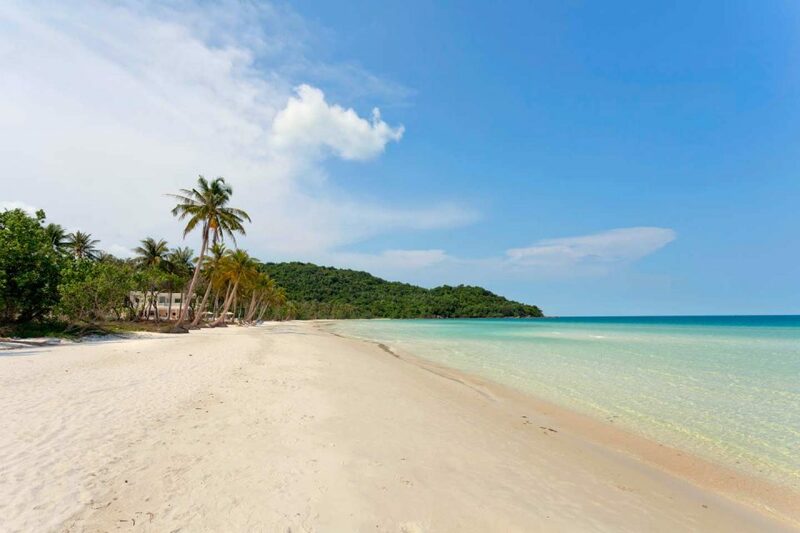 In general, Phu Quoc island is paradise with its perfect white sandy beaches and palm tree-lined waters. However, recently, more and more people have been complaining about the amount of trash washing up on shore. So either its a problem with the tides washing up trash or just pure carelessness on beachgoers and business owners. Nevertheless, there are still people who come here and rave about the island’s beauty so the choice is up to you! Because Phu Quoc Island is one of the most popular beaches in Vietnam, we put together a dedicated post on the best things to do in the area. 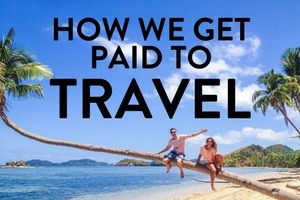 Check our our full article here or view some of the tours available on the island. The biggest island in Vietnam, Phu Quoc Island has captured the hearts of many travelers in its beaches alone. The ultimate island getaway, Phu Quoc boasts sandy beaches surrounded by a diverse topography of national forest land and pepper plantations. The most developed beach on the island is Long Beach (Bai Trong), a yellow-sand beach stretching along the west coast of the island. Similar to Star Beach (Sau Beach), Long Beach and Phu Quoc island, in general, is experiencing a trash problem making it a real hit or miss with travelers. However, some people still love and enjoy going to Phu Quoc so compiling a best beaches in Vietnam list without it didn’t seem right. Travel Tip: Looking for cheap flights around Vietnam? Download the Skyscanner App to find cheap deals. What we love: These islands give you the best of everything. 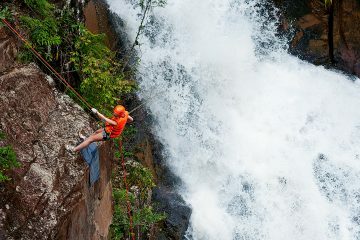 Whether you love biking, trekking, diving or general life watching, you can have it all at the Con Dao Archipelago. Oh, and did we mention that they have amazing green sea turtles? That’s reason enough to go! How to get there: You can easily reach the island by taking a plane from HCMC (daily flights) or the ferry from Vung Tau city (12 hours). Check Bookaway or 12go to see transport schedules. The Con Dao Islands (also known as Poulo Condore) are an archipelago of 15 islands with a total of 200km of stunning coastline and amazing coral reefs. Protected from over-exposure, due to them being far away from the coast, these islands have plenty of pristine beaches, untouched jungles and reefs, and an overall serene atmosphere. Con Son Island, in particular, has very beautiful beaches, with Lo Voi and An Hai being the most popular, and Dam Trau and Bat Dat Doc being the most tranquil. Known for its colonial past where the French built the most notorious prison, who knew it would now contain some of the best beaches in Vietnam! What we love: This is definitely a beach that will take you back to basics in terms of living! How to get there: You can easily get to Ho Coc Beach from Ho Chi Minh City or Saigon via bus, ferry, taxi or hiring your own car. If you’re going to take public transport, check Bookaway or 12go to see transport schedules. Perhaps the most spellbinding of the Vietnam beaches, Ho Coc offers a primitive beach where the gold sand stretches for 5 km. Although small, the beach is so magical with its rolling sand dunes dotted with coracles and large boulders, and the clear waters that lap the shore. Enjoy a day sunbathing and cool off in the Binh Chau Hot Springs. As Ho Coc is still in the early stages of development, you will find the beach will be completely deserted in the week, so enjoy this little gem to yourself. Vietnam generally has a tropical climate, so the best time to visit would be in Spring (February to April) and Autumn (August to October), as the temperatures are moderate and rainfall is lighter. The dry season makes perfect weather for island hopping, diving, and general beach bumming! So, that concludes our Vietnam beaches article! 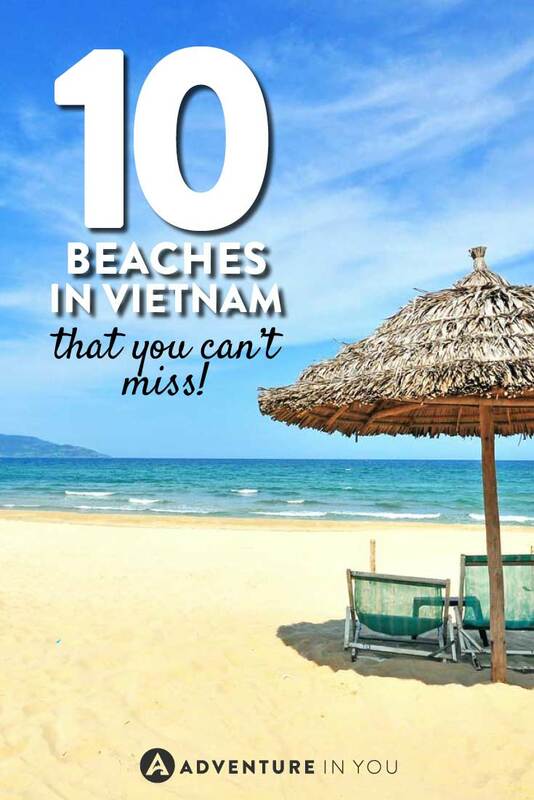 Hopefully, this list will come in handy when planning which beaches to hit in Vietnam. In case you haven’t checked out our other articles on Vietnam, you definitely should as there are loads of useful tips, guides, and information. Happy travels! Tip: Not a beach person? 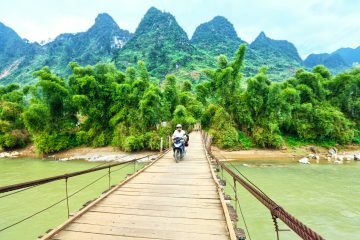 Check out these tours through the Mekong Delta to get a glimpse of the incredible local life in Vietnam. Looking for books about Vietnam to read while you’re away on your beach holiday? 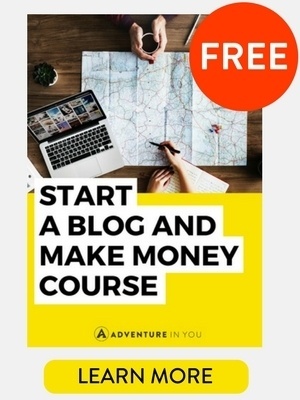 Here are a few of our top recommendations. Last Night I Dreamed Of Peace: The Diary of Dang Thuy Tram Taken from a Vietnamese woman’s diary, this book shows the struggle between humanity, courage, and the struggles of war. 19 Minutes to Live – Helicopter Combat in Vietnam This book is a great memoir featuring a retired Army Officer who served as a helicopter pilot during the war. The book itself is gripping and offers a unique perspective towards this portion of history. Matterhorn: A Novel of the Vietnam War With over 1000 reviews, this book is a fantastic novel about the young soldiers who were dropped into the jungles of Vietnam during the war. The Things They Carried This book by Tim O’Brien gives a fantastic first-hand account of the Vietnam war and how he and his company lived to tell the tale. I absolutely loved HoiAn’s beaches and wish I could have explored others in the area specifically in the south. Php Quoc and Da Nang have gotten on the list since I last visited. Hoping for a trip soon.